The cover of this book caught my eye, so I opened the flap and read a description that included these words: murder, intrigue, conspiracy, Venice, CIA, Catholic Church. That was all it took! And I was not disappointed. This debut novel was great! Daniele is a reclusive computer genius who created an online virtual Venice, known as Carnivia. He is facing charges for his refusal to turn over Carnivia secrets to the Italian government. Holly is a military brat turned Army officer stationed for the first time in Italy, where she grew up. Her post as a community liason sounds boring- until a journalist shows up with a request for information relating to the Bosnian conflict. The files keep happening to get moved, or lost, or shredded, driving Holly to her father’s old friends for help. Kat is an Italian Carabinieri recently promoted to the murder squard. She is assigned to a case involving a dead woman dressed as a Catholic priest. The investigation involves an old (possibly haunted) island and occult symbols. All the while, Kat’s feelings for her older male mentor are getting more complicated. Holt does an excellent job of establishing each of the charaters and their individual stories, and then gradually weaving them together like a spiderweb reaching its center. He throws in plenty of interesting elements, like human trafficking, Catholic controversies, and of course the promised CIA conspiracies. I felt that Holt also did a good job of writing his two female leads. Male thriller writes don’t typically do that well. I was not disappointed in The Abomination. But I didn’t realize how good it was until the book was over- then I couldn’t stop thinking about it. I kept wanting to go back to the worlds Holt had created- both Venice and the virtual Carnivia. Thank goodness this is just the first book of a trilogy! 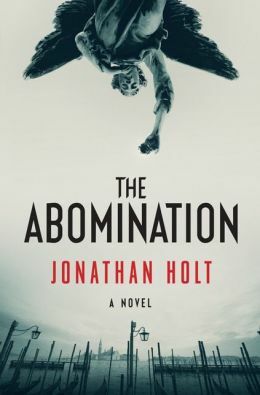 I hope Holt writes the next ones quickly, because I can’t wait to read them! You might like: Daemon, Daniel Suarez. Street Dreams, Faye Kellerman. This entry was posted in Fiction and tagged book review, Catholic church, fiction, murder, thriller, virtual reality. Bookmark the permalink.